I’ve always been into carrot salads. I think the fact that they’re typically studded with raisins is what draws me in — I’m such a sucker for dried fruit! That said, you’ll usually find me eating raisins by the handful rather than spending the time to make carrot salads. This changed after a picnic lunch from Heyday during the Stitch Fix Luna Vacay. There were sandwiches and a bunch of different salads to share. Everything was really tasty but there was a carrot, chickpea and quinoa salad with Moroccan spices that I LOVED. It wasn’t anything too crazy or different but the flavor was on point and I immediately knew I wanted to recreate the salad at home. It only took me a few weeks but before I knew it, I had a big bowl of the best carrot salad I had ever made in my fridge. I think the dressing is what makes this salad. It’s different than any other dressing I’ve posted here one EBF before. 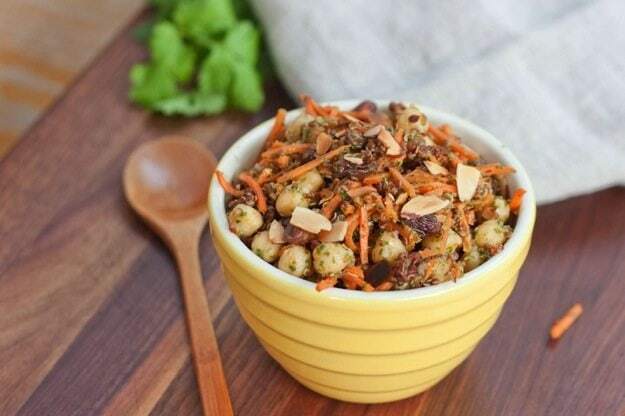 It incorporates toasted almonds, fresh cilantro. smoky paprika, cumin and a little heat from the cayenne pepper. The best part is that you don’t have to worry about picking the leaves from the stems, which is always the annoying part of working with fresh herbs (in my opinion). 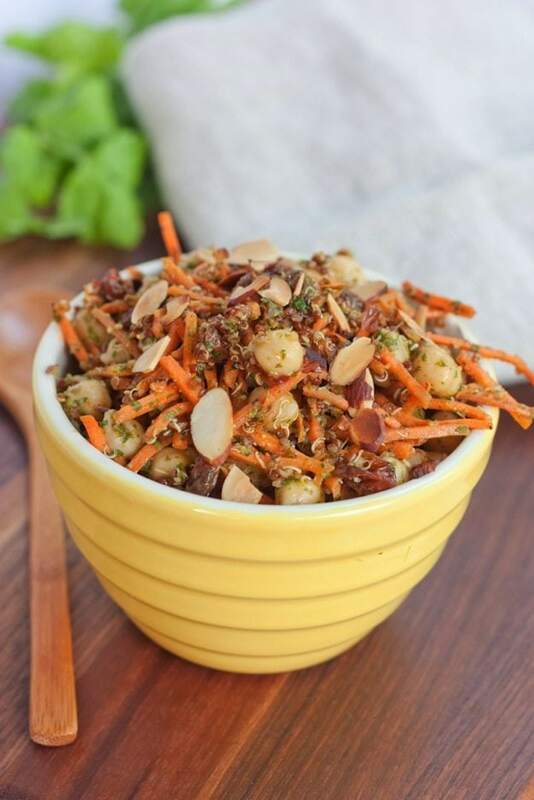 The sweetness from the carrots and raisins pairs perfectly with the fresh cilantro dressing while the chickpeas and quinoa add a little bulk, protein and extra fiber. 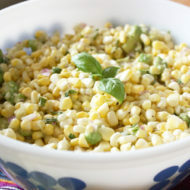 I ate it as a mid-afternoon snack or as a side with lunch or dinner but it would also be a great dish to bring to a potluck or summer cookout. 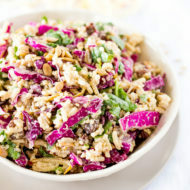 If you like this salad, you can also check out my roundup of quinoa salad recipes. Spray a large skillet with olive oil, add the almonds and toast over moderate heat, stirring, until golden, about 5 minutes. Let cool. Make the dressing: In a food processor, combine the lemon juice with the minced garlic and let stand for 15 minutes. Transfer half of the toasted almonds to the food processor. Add the cilantro, cumin, smoked paprika and cayenne pepper and pulse until chopped. Add the olive oil and process to a chunky paste. Season with salt and pepper; transfer to a large bowl. Add the chickpeas, carrots and raisins to the bowl and toss. Garnish with the remaining almonds and serve. 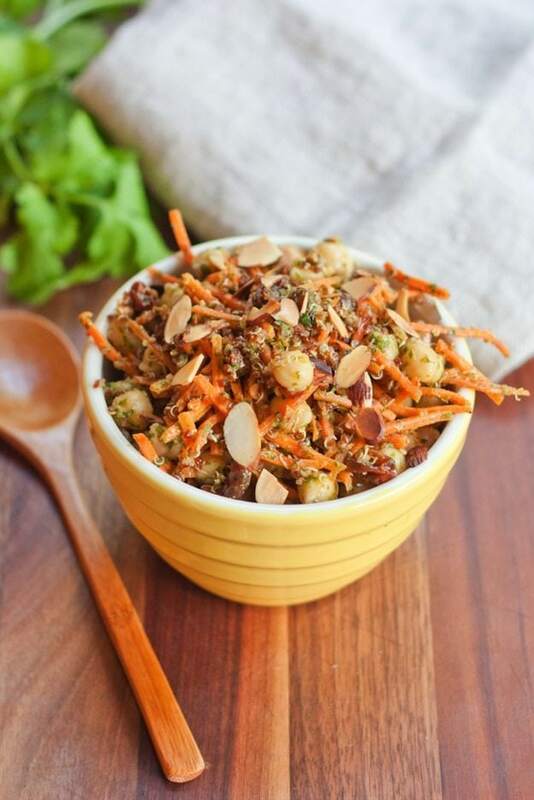 If you want to make the carrot salad ahead of time, it can be refrigerated overnight. Garnish with the toasted almonds just before serving. 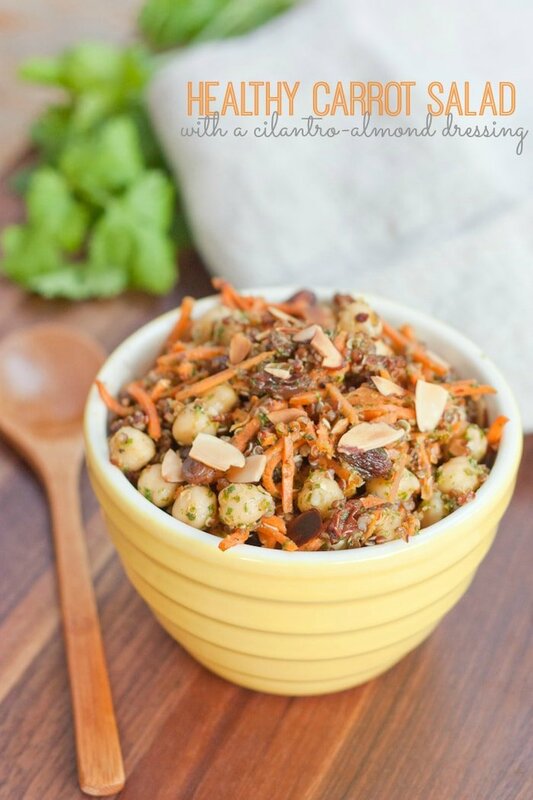 Cilantro-Almond Dressing inspired by Food & Wine’s Carrot and Chickpea Salad. Sounds like a refreshing lunch for a hot summer day. 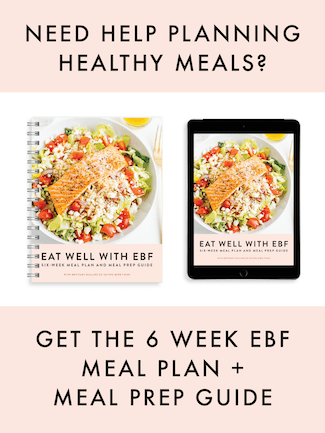 Yup, I’m blogging, health coaching and personal training full-time now. This salad looks delicious! I made your curried hummus dressing last week to go over a big bowl of quinoa and veggies. It was amazing! This one looks just as good – can’t wait to try it out. This is sooo beautiful girl!! Love those colors and all of those amazing flavors. Amazing combination which give us so many folate and vitamin A! What a beautiful summer salad. I usually buy carrots for recipes that call for maybe 1 carrot and then have a bunch leftover that I never use. I will try this wonderful recipe next time that happens, or maybe before!! Thanks. I immediately wanted to make this delicious looking salad and did so last night for my book club taking place tonight. It tasted great before I went to bed and I’m certain it will be even better tonight once the flavors have blended for 24 hours. I am suggesting that for the salad dressing that instead of browning the almonds and making them into a paste, bottled almond butter is quicker and just as good. Mine has no sugar added so as soon as I figured out what the almonds had to be used for, I just plopped a tablespoon of almond butter into the food processor and the dressing turned out very tasty. This looks lovely – I’ve a glut of carrots I need to use up and this looks really tasty – thanks! I wanted to make this immediately but have no cilantro, so, I used baby spinach instead. I’m sure my dressing turned out way greener than the original recipe. However, I think it still tastes great! I also roasted my chickpeas with tamari using Dreena Burton’s Tamari roasted chickpea recipe. All together, this dish is wonderful. I hope it freezes well because this is too much for me to eat in just a few days. Has anyone tried freezing it? Oh yum! 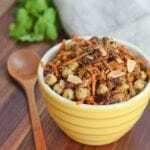 I love that you used Dreena’s Tamari Roasted Chickpeas with it. I LOVE her recipes! I haven’t tried freezing this recipe (or any similar recipes) so I’m not 100% how well it will freeze. If you do end up freezing it, please come back and let me know if it froze well. Thanks Tammi! 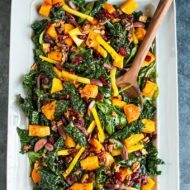 This salad looks so delicious and perfect for the hot summer when turning my oven on isn’t an option. Thanks for sharing this! What do we do with the raisins? Do they go in the food processor, or garnish. Looks delish, will definitely try.